This is our first review of a product from TP-LINK. The company aims squarely at the value-conscious consumer, with products typically priced below functional equivalents from their better-known competitors. TP-LINK says it has decided to make a bigger grab for the U.S. market, so let's see what they have to offer. The TL-WR1043ND represents the top-end of the company's 300 Mbps Wireless N line. Given that position, it's odd that the router is only single band. 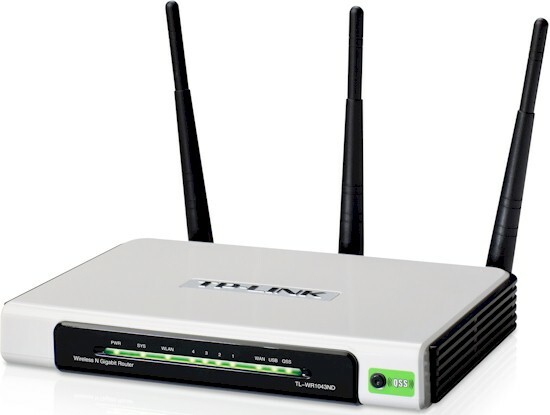 But like most other top-end routers, the TL-WR1043ND has Gigabit Ethernet ports for both its single WAN and four switched LAN ports. A glance at the front and rear panel callouts in Figure 1 shows the product is strictly old-school when it comes to indicator lights—of which it has plenty—and antenna configuration. The three 3dBi antennas are all external and screw on via RP-SMA connectors. The FCC ID photos are detailed enough that I didn't open up the product to take my own. Figure 2 is an internal view, showing the router still in its case. The closer view of the board in Figure 3 was still fuzzy for identifying all the components. But some web searching quickly revealed the key components, which I've documented in Table 1. In keeping with TP-LINK's low-cost focus, the design is relatively dated and is very similar to Buffalo's WZR-HP-G300NH Nfiniti Wireless-N High Power Router & Access Point, which dates from 2009. Since this is our first dance with a TP-LINK router, I'm going to have Craig do a full feature review on it. In the meantime, Figure 4 provides a taste of the GUI, which isn't fancy, but gets the job done. If you're looking for IPv6 support or multiple SSIDs/Guest wireless, the TL-WR1043ND will disappoint. But if you're looking for WDS bridging/repeating or up and downlink bandwidth controls by IP and service port, you'll be happy.